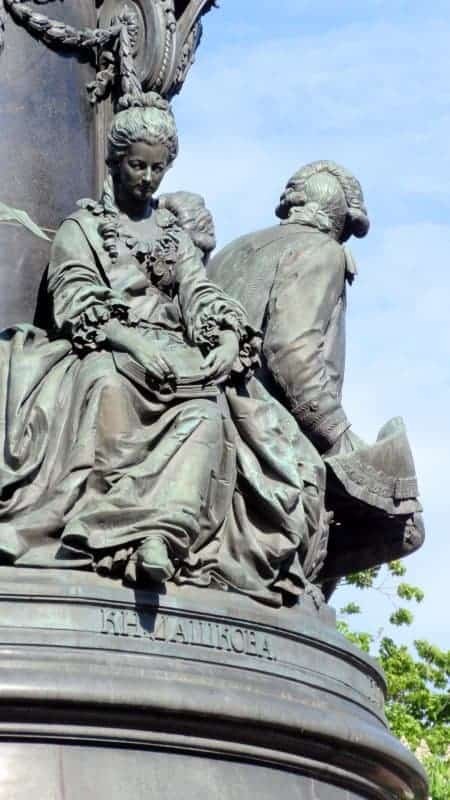 I think I have referred before in a blogpost to the website, ‘Royal Russia‘ – which is a wonderful resource for us Russophiles, specifically those interested in pre-Revolutionary Russia and the Romanovs. Paul Gilbert, who produces this encyclopedic site, has a section of his blog entitled ‘A Russian Moment‘. 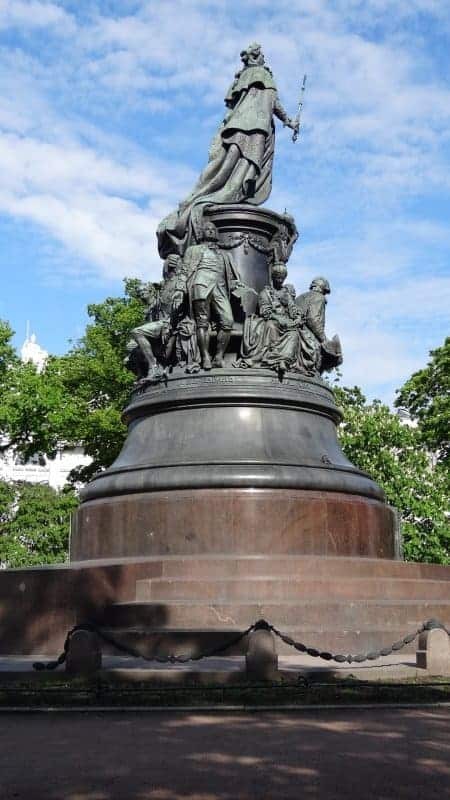 There are some lovely ‘moments’ if you look back through the archive – but the latest one, number 60, caught my eye this week, as it brought back happy memories of our visit to St Petersburg two years ago. 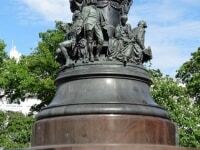 Ostrovsky Square is one of 13 squares designed by Carlo Rossi (1775-1849), the major architect in St Petersburg of the early 19th century. 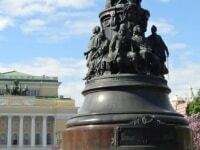 The square faces Nevsky Prospekt, and is surrounded by numerous historical buildings, including the Alexandrinsky Theatre. Both the square and the magnificent Empire style theatre were named after the Empress Alexandra Feodorovna, wife of Emperor Nicholas I. To the east is the garden and pavilions of the Anichkov Palace. To the west is the multicolumn Russian National Library. 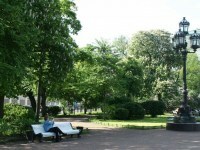 In 1923, the square was renamed in honour of the Russian playwright Alexander Ostrovsky (1823-1886). 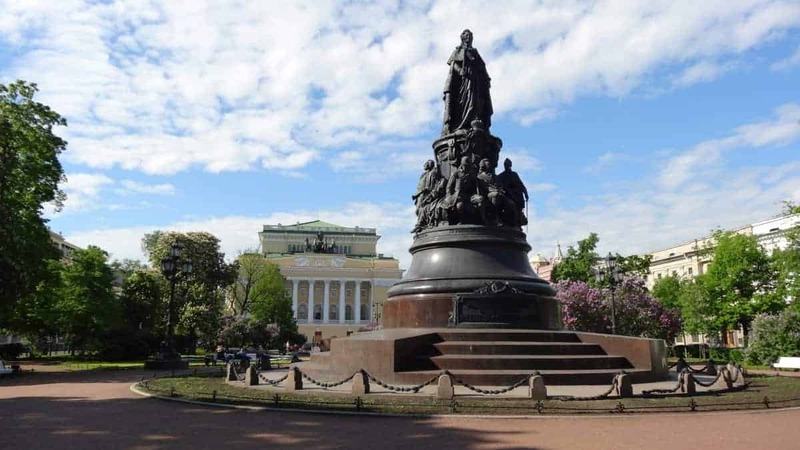 Situated in the center of Ostrovsky Square is Catherine’s Garden and St. Petersburg’s only monument to Empress Catherine II. 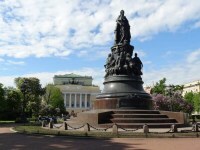 Built in 1873, the monument is endowed with the symbols of power (sceptre and laurel crown) and surrounded by Catherine’s favourites: Alexander Suvorov, perhaps the most famous general in Russian history, Prince Potemkin, the general and politician, Ekaterina Dashkova, the first woman to chair the Russian Academy of Sciences, and the celebrated poet Gavrila Derzhavin.. 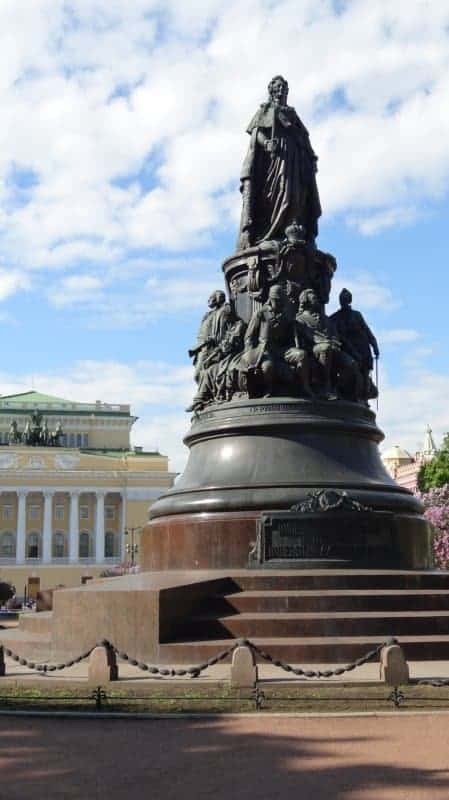 This statue escaped the fury of the Soviet government, which toppled all the other ones of the empress after the 1917 Revolution. 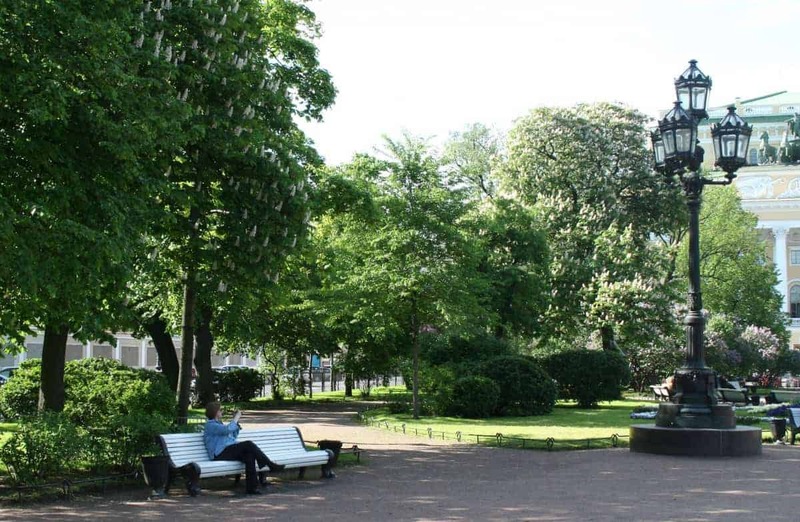 Here are some photos of the square which we took in May 2013. 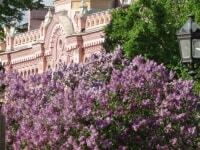 It was pleasing to see the lilacs in bloom as I associate May in Russia with lilacs. 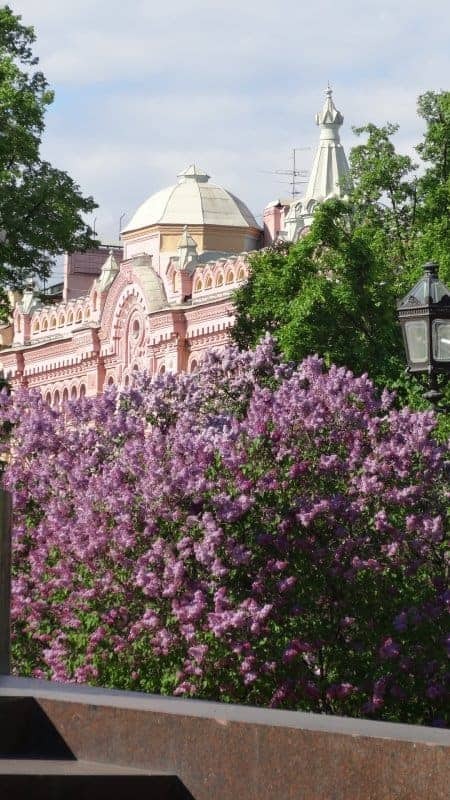 In 1987 when we arrived for our long stay in Moscow, one of my first impressions was of all the purple and white lilacs blooming in May in front of the British Embassy, on the embankment of the Moskva river.